St. Stephen’s was established in 1848 at Old Williamsport about two miles from Innis, and admitted into the Convention of the Diocese of Louisiana in 1849. It is the oldest brick edifice in Pointe Coupee Parish, and was designed by J.A. Willis of New York. The seventy foot long building was built with local materials, and the bricks used were molded and burned on site beginning in 1850. High water impeded progress the first years, and all the brick was not made until 1856. 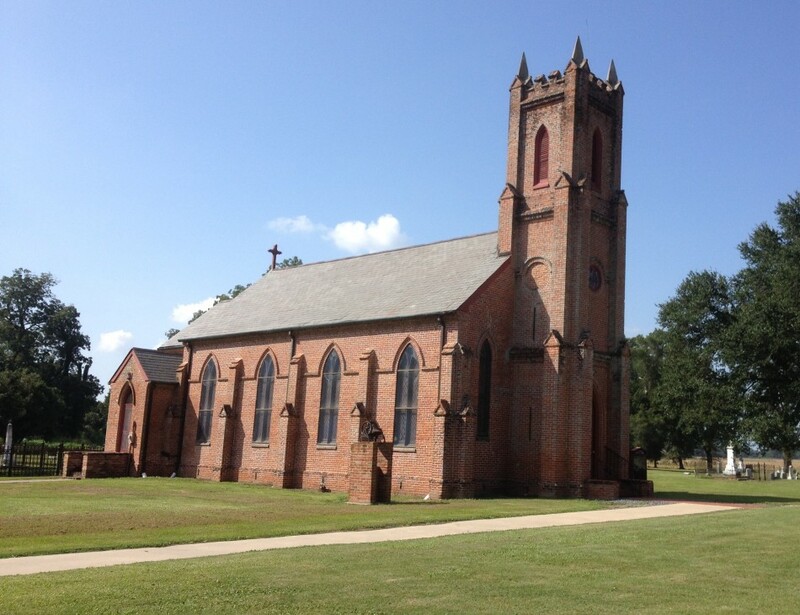 Building was completed by 1858, and finally St. Stephen’s was consecrated on May 1, 1859 by Bishop Leonidas Polk. The Gothic design used color and light to subdue the brightness outside to a dimness to calm the troubled spirit. Among it features are: pilasters at regular intervals to support a slate roof, stained-glass windows of Gothic design made in England and shipped up the Mississippi River, a bell tower with four pointed stone corners. The entrance doors, pride-dieus, and pews were handmade, and are still in use today. The communion service, still in use, was given by the Taylor family, relatives of General Taylor. The first boy’s choir in the Diocese was established at St. Stephen’s in 1848. In the 1870’s, a period without a rector and also during a flu epidemic, Bishop Polk appointed Mrs. Sara Archer as the first woman Lay Reader in the diocese, an unprecedented action, due to the shortage of men to conduct the services. Through her devotion and faithfulness the church was kept open until a rector could be found. St. Stephen’s is the oldest Episcopal Church building in the Diocese which has not undergone some design change. It is the third oldest church building, and the thirteenth oldest parish in the Diocese. It was completely restored and placed on the National Register of Historical Places in 1978. In its cemetery grounds it has a monument erected to honor a Confederate unknown solider. Since its beginning, St. Stephen’s has held services every Sunday. May we continue to be witnesses for God in this community.